Gaius Sextus, First Lord of Alera, grows old and lacks an heir. Ambitious High Lords plot and maneuver to place their Houses in positions of power. A war of succession looms on the horizon. Far from city politics in the Calderon Valley, the boy Tavi struggles with his lack of furycrafting. At fifteen, he has no wind fury to help him fly, no fire fury to light his lamps. Yet as the Alerans’ most savage enemy – the Marat – return to the Valley, he will discover that his destiny is much greater than he could ever imagine. Caught in a storm of deadly wind furies, Tavi saves the life of a runaway slave named Amara. She is actually a spy for Gaius Sextus, sent to the Valley to gather intelligence on traitors to the Crown, who may be in league with the barbaric Marat horde. And when the Valley erupts in chaos – when rebels war with loyalists and furies clash with furies – Amara will find Tavi’s courage and resourcefulness to be a power greater than any fury – one that could turn the tides of war. The unity of the Alerians hangs in precarious balance. The First Lord of Alera has fallen in his efforts to protect his people from the vicious attacks of their enemies. The strain has made him unconscious, almost dead and nobody can tell whether he would recover or not. Now, the fate of the Alerians lies in the hands of Tavi, a young man who must use all of his courage and resourcefulness to save his people–and himself. Meanwhile his uncle Bernard’s people are being attacked by vord – strange spider-like creatures who can overtake your body and use it for their purposes. Any help from the capital would be very welcome but how ask for help an unconscious ruler? Codex Alera takes place during the reign of a Rome-like empire. While the relationship between ancient Rome and the realm of Alera is only alluded to over the course of the series, having been lost to history, Butcher confirmed that the people of Alera are the descendants of the “lost Roman legion” (the Legio IX Hispana) and its camp followers, which had been transported to the continent of Carna—an effective “drop chute for the Bermuda triangle”. That explanation worked for me just fine – in fact the setting was one of few assets that allowed me to continue reading the novels. Somehow ancient Rome and magic fit well together. Still let’s face it: after two parts (and there are six parts altogether) I found so many things to criticize the author for. Long infodumps disguised as dialogues. Deus-ex-machina solutions to serious problems. Wrong pronouns in many places. A barbarian girl, born and bred in a forest, who not only manages to survive but practically thrives in a foreign city. Characters which are merely cardboard cutouts (yes Tavi, my dear, and you, Bernard, I am thinking of you). The Marats suddenly turning from ugly savages who eat their enemies alive (sic!) into nice, noble and philosophical warriors. However, there was one thing Butcher did very well in my opinion- the baddies. You know I often carp about the lack of proper enjoyment from the side of Black Hats; well, this time I found the villains far more interesting than the protagonists. Contrary to Tavi and his almost sickeningly sweet aunt and uncle, the baddies were delightfully complex, three-dimensional creatures, both men and women. Fidelias, Odiana, Invidia, even Gaius Sextus, First Lord of Alera – I read the majority of the second part just for them. Yes, they committed serious crimes, yes they were cynical and flawed but they were not without merits. What’s more, sometimes the White Hats had to seek their help and cooperate. Such scenes made me going through the narration and wait for more. The last thing: I truly enjoyed the fact that a fantasy series penned by a male writer featured more than one intrepid woman; they were completely able to defend themselves and their loved ones. The Bechdel test passed with flying colours, imagine that! A bunch of surprisingly well-rounded baddies saved this one for me. I might continue reading. 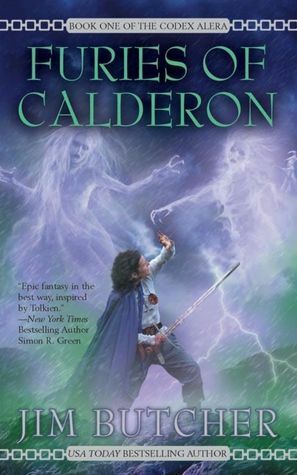 This entry was posted in adventure, alternate history, book review, fantasy, historically-flavoured, YA and tagged academ's fury, boring protagonists, codex alera, furies, furies of calderon, great baddies, intrepid females, Jim Butcher, magic, series alert. Bookmark the permalink. “Might continue reading” on your side is definitely not enough to get me interested. But I wasn’t Harry Dresden fan either. If you didn’t like Harry Dresden stay clear of this series. I didn’t manage to finish it after all – too few scenes with my favourite baddies I guess – and fans of The Dresden Files usually tear Codex Alera to pieces. I have to add they are right. Yessssss I love a good baddie! I am trying :). Hard. I read a few of the Harry Dresden books but lost interest. I’m terrible with series, honestly. 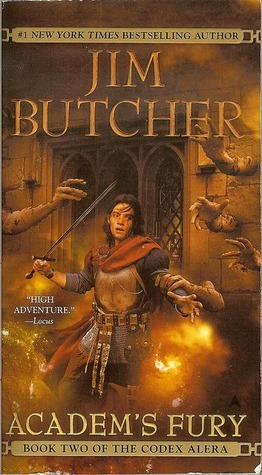 Idk, Butcher’s a good writer but I’m not sure he’s in my wheelhouse, especially with the whole series thing. Harry Dresden dragged and dragged forever – honestly if a series has more than ten parts I doubt about its quality.